Disclaimer: Individual results and activity levels after surgery vary and depend on many factors including age, weight and prior activity level. There are risks and recovery times associated with surgery and there are certain individuals who should not undergo surgery. SuperPaths are percutaneously-assisted total hip surgery, or SuperPath® surgery, is a newer, more novel technique of performing a standard total hip arthroplasty where your surgeon utilizes a smaller initial incision and, more importantly, a very limited dissection in the deep tissues. This technique avoids cutting any muscles or tendons and thereby not having to repair them during surgery and wait for them to heal for an extended period postoperatively. This technique performed by cutting through the superior part of the capsule only is also referred to as the northern approach or northern exposure. The SuperPath® technique is a restorative technique because it enables the surgeon to utilize specialized instruments and tools to remove the diseased hip and implant the new components while the hip remains in a natural rested position during the surgical procedure. 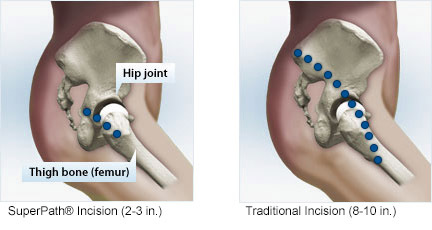 By contrast, traditional techniques require twisting and contorting the lower extremity in order to dislocate the hip joint to perform the surgery, with the possibility of complications such as increased postoperative soreness, all the way to intraoperative fractures of the femur requiring more extensive surgery. The SuperPATH® approach combines cutting-edge technology and advanced surgical techniques to encourage soft tissue preservation and enables patients to shorten their recovery to weeks, rather than months as in traditional approaches. SuperPath® hip replacement is a differentiated total hip technique being performed by a growing number of experienced surgeons. With SuperPath®, there is no surgical dislocation of the hip. Patients can also have as little as a 3-inch incision. It is important to understand that “less invasive” does not only refer to the incision but also means less trauma to the muscles and tendons under the skin. A SuperPath® Hip Replacement is designed to precisely reconstruct the hip without cutting critical tendons and stretching or traumatizing muscles that are important to hip function.